BuzzNumbers, an Australian social media monitoring service, has launched the free BuzzElection service monitoring election mentions online. BuzzElection includes a tool tracking the online discussion of election issues by the level of interest, state by state analysis and an analysis of the most influential tweeters in the election debate. This type of tool allows the public to better understand the broader views and trends during an election, without relying on potentially biased media reports. This type of online monitoring approach is highly adaptable and could be used, for example, for tracking politician behaviours and attitudes online separate to media coverage. 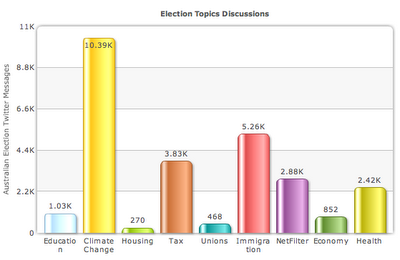 Below is a chart based on data to 29/7/2010 giving a view of the top election issues discussed online via Twitter. "This type of tool allows the public to better understand the broader views and trends during an election, without relying on potentially biased media reports." Can we use this as a quote on the website? Offer vitamins and supplements, sports nutrition, intimacy enhancement, body building, diet and weight loss products, bath and beauty, herbal detox and body cleansing, vitamin and herbs and more. Visit Us for the latest trend on health and fitness related product and news. With our extensive selection of product you sure to find all your supplement need and achieve your training goals.